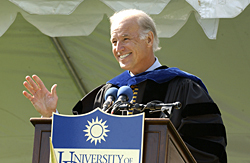 U.S. Sen. Joseph R. Biden speaks at UD's Commencement exercises in 2004. 9 a.m., Aug. 23, 2008--U.S. Sen. Joseph R. Biden Jr., a University of Delaware alumnus, has been selected to run for vice president of the United States by presumptive Democratic Party nominee Barack Obama. Obama announced the selection by text message and on his Web site early Saturday morning. Biden is a 1965 graduate of the University and in 2004 was presented an honorary doctor of letters degree. 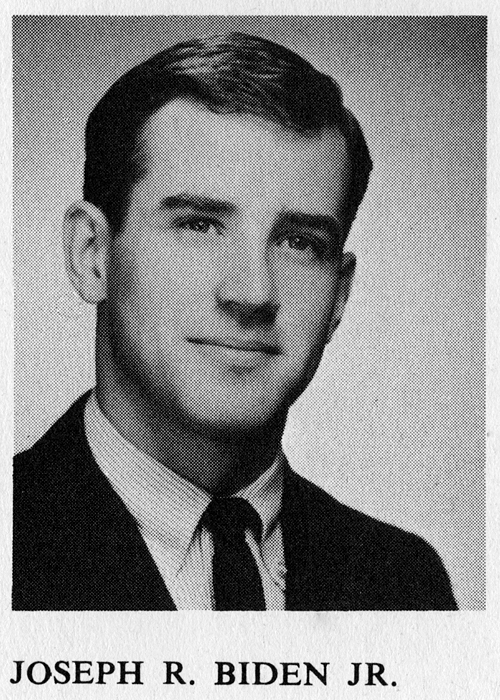 Biden graduated from UD in 1965 with a double major in history and political science, and went on to graduate from the Syracuse University College of Law in 1968. He was first elected to the U.S. Senate in 1972, at age 29. He has remained a strong supporter of the University, providing important healing through a powerful speech Sept. 19, 2001, following the terrorist attacks of 9/11, welcoming the 2003 NCAA Division I-AA national championship football team to the halls of the Capitol and delivering the 2004 Commencement address. Biden appeared on MSNBC's Hardball with Chris Matthews live from Mitchell Hall on Jan. 15, 2003, as the United States prepared for war in Iraq. Biden was inducted to the UD Alumni Wall of Fame in 1984. Biden is well known for his leadership role on foreign policy and, as the chairman of the Senate Foreign Relations Committee, is the Democratic Party's chief spokesperson on national security and foreign policy issues. A strong leader on anti-crime and drug policy, Biden has been instrumental in crafting virtually every major piece of crime legislation over the last decade. He is the author of the Violence Against Women Act of 2000, which contains a broad array of ground-breaking measures to combat domestic violence and provides billions of dollars in federal funds to address gender-based crimes. Chairman of the International Narcotics Control Caucus, he also wrote the law creating the nation's "Drug Czar" who oversees and coordinates national drug control policy. In 1998, Biden introduced a Senate resolution addressing the problem of binge drinking on college campuses, and cited UD as a leader in efforts to solve the national issue. He was on hand when the Center for College Health and Safety presented UD President David P. Roselle its Presidents Leadership Award for his work in curbing such high-risk behaviors during a ceremony held in March at the National Press Club in Washington. Biden also is a strong advocate for protection of the environment and his work over the past 20 years has led to the end of federal control and the return to Delawareans of more than 1,180 acres of beach shoreline along the Delaware coast. In 2000, his decades-long efforts culminated with establishment of Delaware's first and only National Wild and Scenic River, the White Clay Creek Watershed, which will be preserved and saved from development for future generations. Biden has been a staunch supporter of college aid and loan programs, and to prepare today's students to meet the technology challenges of tomorrow, He has undertaken initiatives in the Senate to close the "digital divide" and Biden's "Kids 2000" legislation, signed into law by the president in October 2000, establishes a public/private partnership to help provide computer centers, teachers, Internet access and technical training to young people across the nation, particularly to low-income and at-risk youth. Biden is married to Jill Jacobs-Biden, AS '75, CHEP '06EdD.